Hey girl hey! I am a mascara addict. Seriously…I think I get a little too excited when I buy a new one. I love trying out new mascaras, especially volumizing ones. About a year ago, I found a mascara that I cannot live without. Out of every mascara I’ve tried, it is the best. In today’s post, I’m going to share that mascara with you, as well as where you can buy it and how to use it. If you want to learn more, keep on scrolling! This post is not sponsored in any way, shape, or form. All opinions are my own. I was not asked to post this, or compensated for posting. The product link below is where I get mine from. I do not receive commission from this link. First and foremost, I will be honest and say that I naturally have thicker lashes. I do wear falsies from time to time, but I’ve never had an issue with lash growth or length. However, that does not take away from how awesome this mascara is! I pretty much always look for a volumizing mascara, because I love the look of fluffy lashes. I’ve tried it all. Every single mascara you can think of, I’ve tried at least once. This mascara seriously is the best. I’m not a huge believer in MLM businesses. I know they work for some, and I see the people who they work for. I get it. Do you, boo. I just don’t want to be a part of all of that. However, this mascara IS part of an MLM, and I still would sign up for every preferred customer program and auto shipment JUST for this mascara alone. No joke. It makes your lashes seriously look like falsies. Scroll down for details on what it is and how to purchase! Younique’s Moodstruck Epic Mascara is absolutely incredible. I purchase mine from my friend Kelley who is a hairstylist and makeup artist. After one coat of this mascara, my lashes look like falsies and don’t feel weighed down. I cannot say enough good about this mascara! 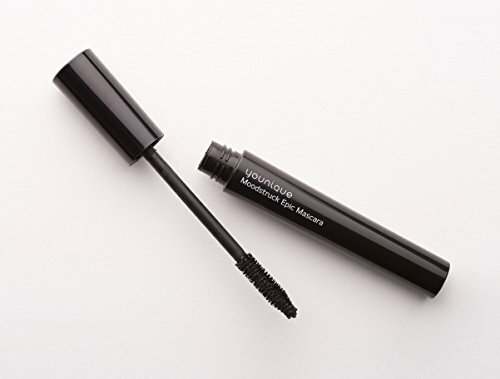 It’s non-clumping, volumizing, lengthening, and perfect for any type of lashes. It curls your lashes and gives them the perfect length that brightens up the eyes. Plus, it comes in brown and a waterproof option if that’s your jam. Personally, I just use the regular straight up black one, because I hate waterproof mascara & brown just doesn’t do it for me. As you can see, one coat makes your lashes look absolutely incredible. It takes little to no effort to make your lashes look ultra glam! I skip falsies all the time because this mascara almost always does the trick. After two coats, I am good to go. If you’re looking for super thick and voluminous lashes, wiggling your mascara onto your lashes is key! Start at the base and pull the wand through your lashes in a zig zag motion. This motion helps to prevent clumping, and gives you the extremely thick lashes when done correctly. If you feel like your lashes look clumpy, take a spoolie or clean mascara wand and brush through your lashes. If you have issues with your mascara smudging, check out my tip for that HERE! There ya have it! There is my favorite mascara ever! Please reach out to Kelley on her Facebook page HERE & if you’re ready to purchase, click HERE! Ya’ll know I don’t just endorse any product. I only endorse products that I’ve had a consistent good experience with. Trust me, you will NOT want to skip out on this one!